Friday AND pay day?! Gimme that ice cream. 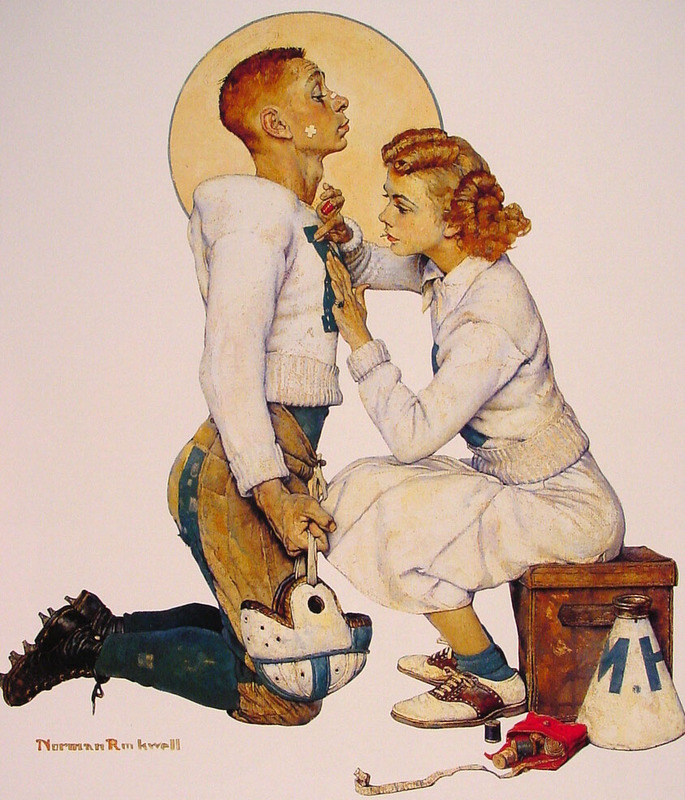 I found some more Norman Rockwell paintings that celebrate baseball. Can you imagine if he’d seen how well the Cubs are playing this season? Well, not the last week. My mom gets ESPN’s push notifications, and she was NOT PLEASED with this past week. I’m going to call this a series, and a brief series at that. But come on, can we think of anything more American than Boy Scouts?! Oh right, that baseball apple pie stuff. Cangiante is the third installation in this series on Italian Renaissance painting styles. WAHOO! Michelangelo‘s Sistine Chapel is a particularly miraculous example of cangiante (it’s Italian for “change”). It means to use lots of tints and shades of color, even if it means using different colors completely to achieve a realistic shadow. For example, mixing red into the shadow of yellow to make it appear darker on canvas (or, in this case, plaster). Note: I’ve already covered this, but ICYMI: The Prophet Isaiah, pictured above, was the influence behind Norman Rockwell‘s Rosie the Riveter. Boom! Drop that tidbit on a girl over burgers tomorrow and see what happens! God, I love a lanky quarterback. Sometimes art is prepping for football, whether that’s making gluten-free cornbread for your chili, or stitching up your fellow ginger’s jersey. Whatever it may be, I hope you plan to wear those victory curls and saddle shoes. Because I definitely do. Happy Election Day, America! Get out there and perform your civic duty. 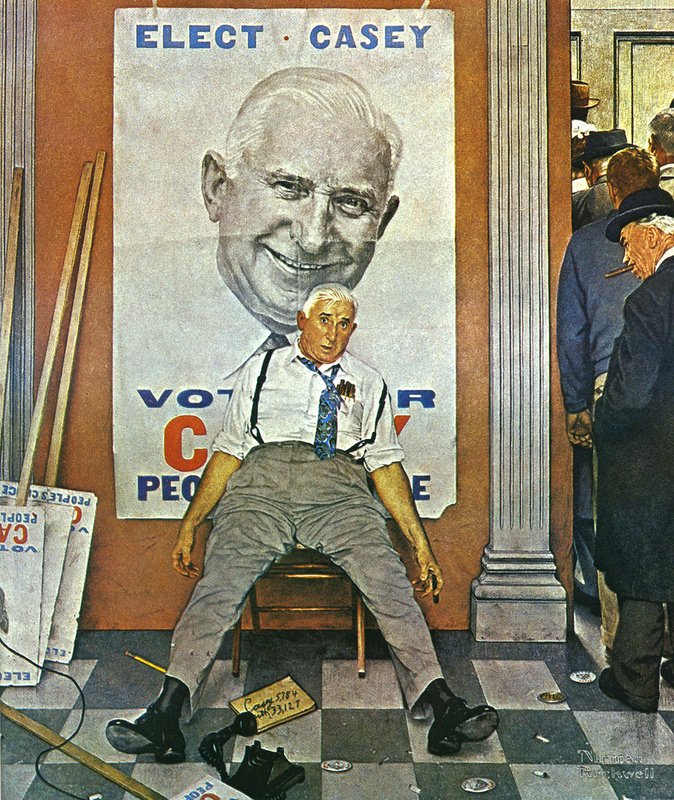 Norman Rockwell’s “The Losing Candidate” was featured on the cover of the Saturday Evening Post on November 8, 1958. The model is actually Bernard Casey of Boston, who served 8 terms in the state legislature. The man with the cigar on the right lived in Rockwell’s town of Stockbridge, MA, where he delivered the mail for more than fifty years. c.) those house slippers and that messy bun are TO DIE FOR. I guess I should also tell you girl that your kid looks annoying, but I’m a major fan of the overall comeback, so I’ll just let you gloat over that Truman victory some more. Rosie the Riveter stands on Hitler’s Mein Kampf during her lunch break while Michelangelo’s Isaiah from the Sistene Chapel nonchalantly acknowledges what is a very possessed angel. Same sitting pose (three cheers for art appropriation! ), but Rosie wins this contest, hands down. 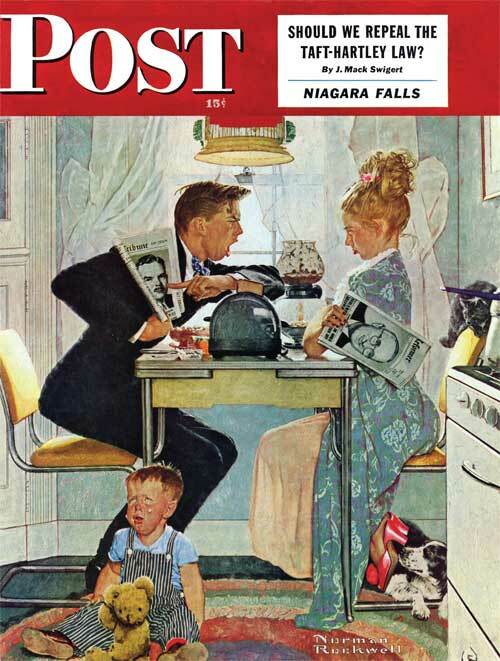 Norman Rockwell’s “The Critic” first appeared on the cover of the Saturday Evening Post in 1955. 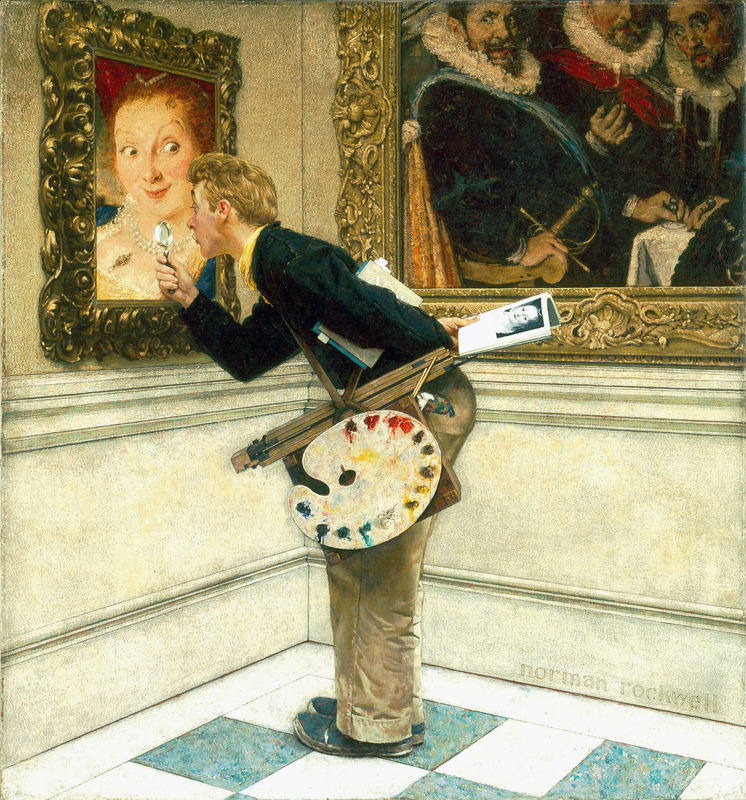 Rockwell used his oldest son as the model for the studying art critic. He honored his mother by making her the portrait at which he’s looking carefully. Her red hair was added for fun by Rockwell. You know what’s fun? Cotton candy, baseball games, ice cream bars. You know what’s not? Being a ginger in the summer.